The lightest, most powerful twin-cylinder bike ever and true competition-level traction control system supplied as standard for maximum track performance. The specification of this engine underlines its no-compromise race technology. To help contain the massive ‘R’ power output, the crankcases and cylinder heads have been sand-cast produced, a process that improves the molecular quality of the casting, increasing strength while ensuring that intricate shapes are achieved with absolute accuracy. Confirming the 1098 R’s race specification by minimising weight and increasing performance, the crankshaft connecting rods are made in titanium saving 130 g over the stock 1098 rods while reducing their reciprocating forces and improving crankshaft acceleration. Cam belt covers moulded in carbon fibre and cam covers cast in magnesium alloy complete the lightweight package. 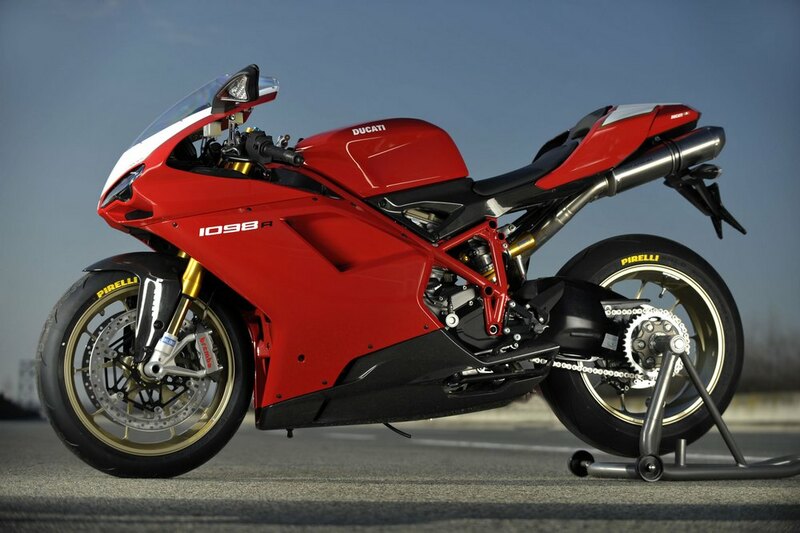 The result is a weight saving of 5.6 kg (12.34 lbs) over the 999 R engine and 2.2 kg (4.8 lbs) less than the 1098. These incredible valve performances are only possible because of Ducati’s unique Desmodromic system, where valve closure is activated mechanically. At high rpm it would be almost impossible for the valve to follow the steep closure profile of the cam lobe if it were relying upon a normal valve spring, but with the Desmo system the valve is mechanically closed with the same accuracy as it is opened, enabling steep cam profiles and radical cam timings. 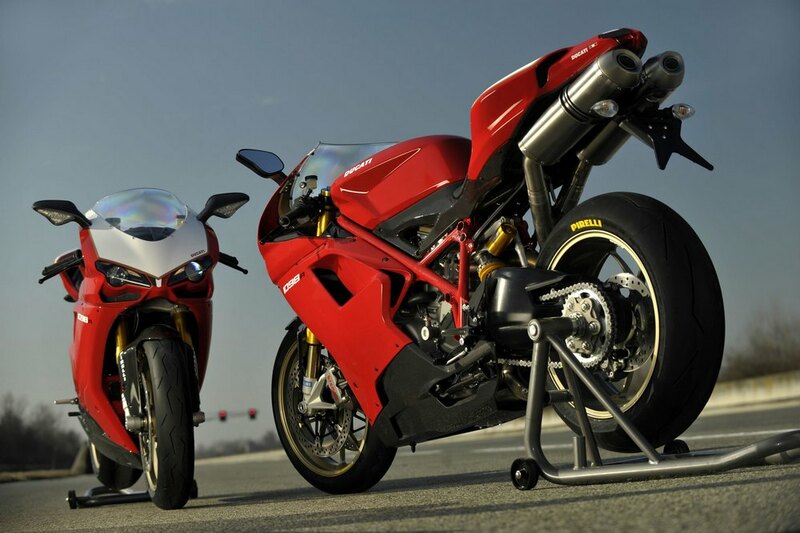 This system is used on every single Ducati motorcycle including the world-beating Desmosedici MotoGP bike. The pistons utilise the same design developed for the Desmosedici in the Ducati MotoGP program by using a distinctive double-ribbed undercrown to achieve high strength with minimal piston wall surface area and, therefore, less friction. In this way, the 106 mm RR58 alloy components are able to operate reliably at high rpm while delivering incredible performance. The gearbox shares the same ratios as the 1098 and 1098 S, except for 3rd, 4th and 6th gear, which has a higher ratio so as to be able fully exploit the speed gained from the supplied race kit or additional performance modifications. Also with performance in mind and because of its high resistance to fatigue, the gears are machined from the same high-strength steel used in Ducati Corse race applications with 3rd, 4th, 5th and 6th gears being subjected to a shot-peening treatment that further ensures their strength and reduced fatigue. The dry, multiplate ‘slipper’ clutch reduces the destabilising effect of aggressive downshifting and helps provide the fine control required when used under extreme track conditions. As with all the models in the Superbike family, the front subframe is produced in magnesium alloy to reduce the weight to just 0.61kg (1.3 lbs). While its construction ensures secure, rigid support for the headlamp, instruments and fairing, the weight-saving around this high, forward position contributes considerably to overall ‘feel’ and control of the machine. Underlining its competition intention, the 1098 R is designed as a true ‘monoposto’ with no provisions to carry a passenger. By producing the rear subframe in aluminium alloy it has enabled a 50% weight reduction (compared to biposto models) to 1.3 kg (2.8 lbs). 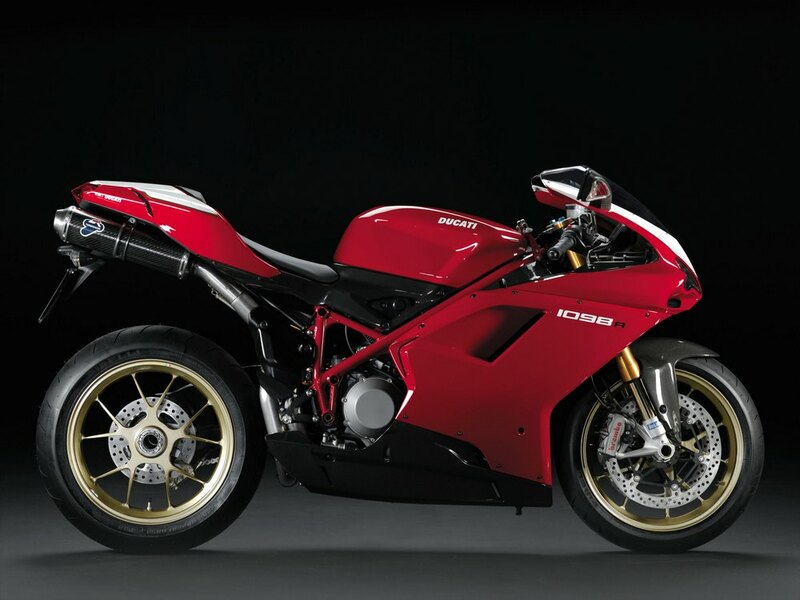 The 1098’s unique single-sided swingarm is made up of main operational components in aluminium castings so as to ensure strength around the pivot points, wheel hub and suspension links, with fabricated aluminium sections used to fuse the construction into a single, beautifully engineered component. For the ‘R’ model, the swingarm is finished in black to denote its racing status as well as to contrast sharply against the ‘racing gold’ wheels. this exclusive shock gives top performance while enabling considerable weight-saving over similar components produced with traditional technology. The TTXR uses twin tube technology and offers totally separate damping adjustment in compression and rebound. It uses experience gained in MotoGP to minimise friction and reduce the risk of cavitation under extreme conditions. A vitally important feature of the rear suspension system is the ability to adjust rear ride height independent of spring pre-load and other suspension settings, critical when seeking the perfect set-up for personal riding style or track conditions. 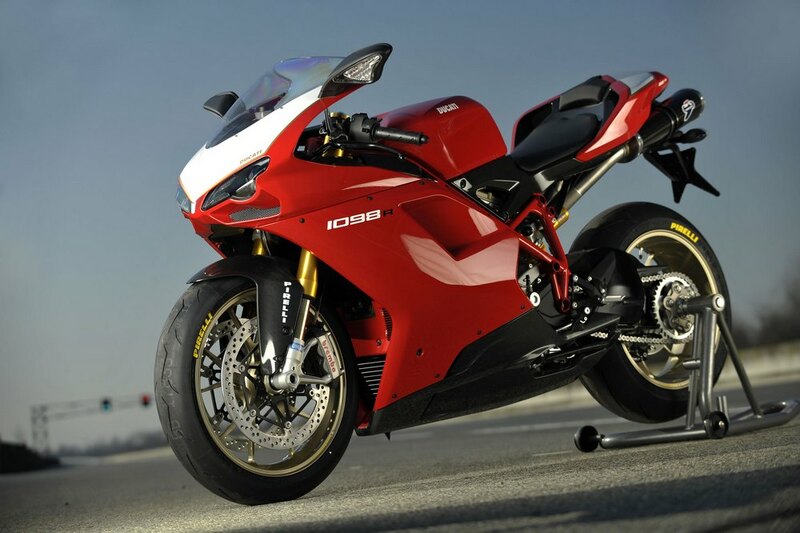 The 1098 R is also equipped with Brembo’s Monobloc caliper racing technology. The M4 calipers use four 34 mm pistons and two large surface pads for maximum stopping power. The calipers are machined from a single piece of alloy compared to the bolt-together construction of conventional ones. The Monobloc design has much higher rigidity and resistance to distortion during extreme braking and gives a much more precise feel at the brake lever. 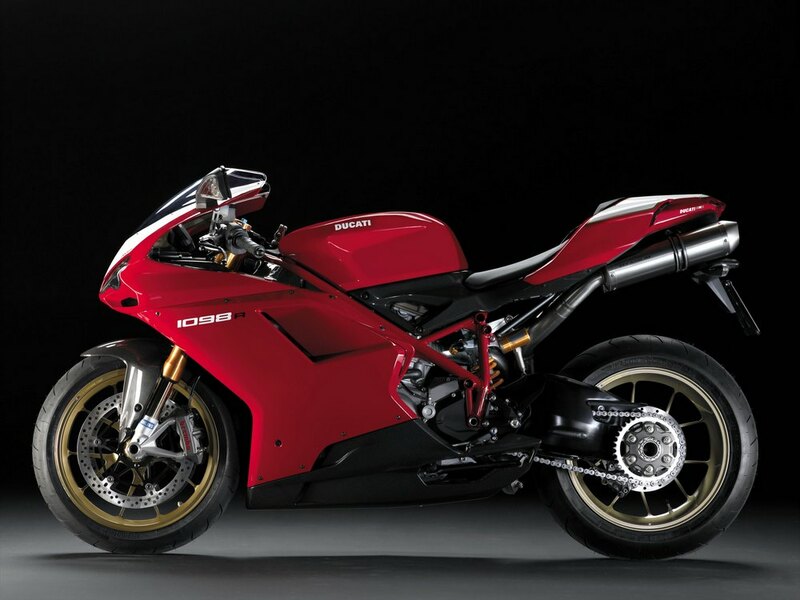 The massive 330 mm discs and Monobloc caliper technology combined with the legendary stability of Ducati’s Trellis frame and the 1098 R’s lightweight 165 kg (364 lbs) now makes world championship level brake performance available for the road. Wind-tunnel development has enabled excellent aerodynamic penetration, allowing the rider to take a perfect racing stance, effortlessly. Great care has been taken in the design of the air supply ducts so to ensure efficient air-flow through radiator and oil coolers as well as provide ample air delivery to the airbox feeding the powerful Testastretta Evoluzione engine. The fairing belly-pan, tank lower side panels, seat assembly and front fender in carbon fibre are contributing factors to the overall performance of the machine. 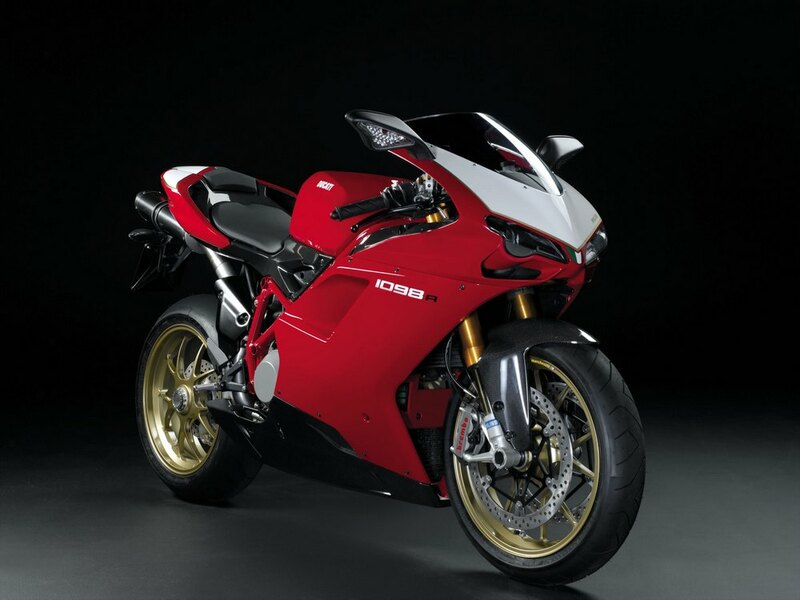 In true ‘R’ style, the red bodywork sports white background number plates on the tail section and nose fairing. The front and rear Marchesini wheels are finished in ‘racing gold’, exactly the same as the F08 official factory race bikes and the fairing belly-pan, front fender and side panels are left in a contrasting natural carbon fibre finish. Desmosedici-style digital instrumentation is taken from Ducati’s MotoGP World Championship winning GP7 project. This pure racing, minimalist solution has no switches or buttons to compromise its clean lines. Instead, information additional to the default read-out is managed by handlebar-mounted switch gear, allowing the rider to scroll through and select from various menus. The default read-out presents rpm and speed, with the former displayed across the screen in a progressive bar graph. Optionally, the rpm and speed can be displayed in numeric values. The instrument display also doubles as a control panel for the activation of the data acquisition system as well as listing lap times recorded by using the high-beam flash button as a stopwatch. For the 1098 R, fitting of the race kit initiates dialogue between the race kit ECU and the display to activate the DTC (Ducati Traction Control). 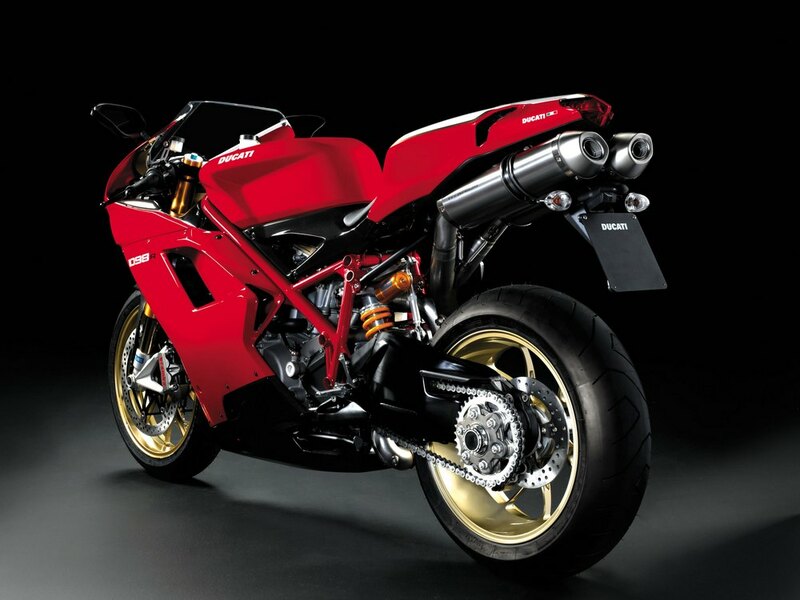 Once again Ducati raises the bar for the sport bike category by transferring its MotoGP race technology into roduction. Normally used on race bikes only, the system records numerous channels of data including throttle opening, vehicle speed, engine rpm, engine temperature, distance travelled, laps and lap times. The system also automatically calculates engine rpm and vehicle speed data so as to also display gear selection as an additional channel of information. At the end of a ride or track session, up to 2 mb (approximately 3.5 hours) of data can be downloaded to a PC ready to compare, analyse and get an inside view of the performance of both the rider and the 1098 R.
Data can be analysed in graphic form with options to zoom into detail of specific sections. Dragging a trace along a timeline to reveal individual values of the above listed channels enables the user to analyse performance in the same way that data technicians are able in factory teams. 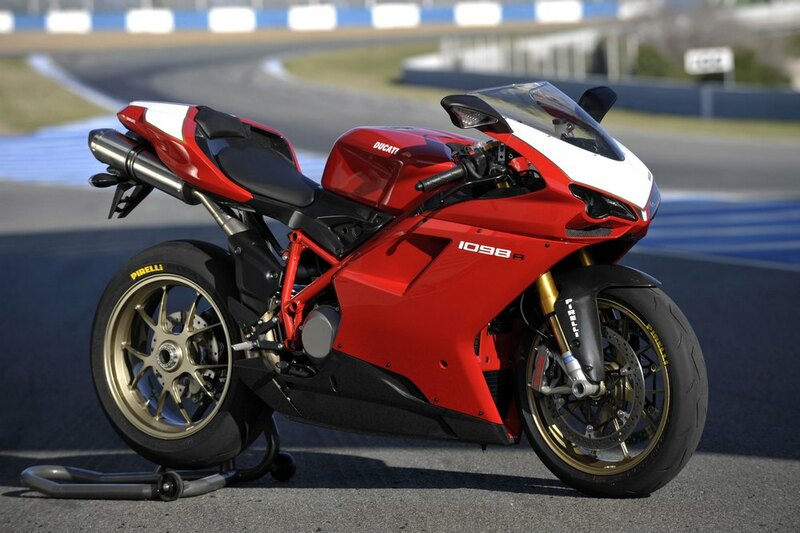 Front brake -2 x 330 mm semi-floating discs, radially mounted Brembo Monobloc calipers 4-piston, 2-pad. Instruments -Digital MotoGP derived unit displaying: Speedometer, rev counter, clock, scheduled maintenance warning, warning light for low oil pressure, fuel level, oil temperature, fuel reserve, trip fuel, neutral, turn signals, average speed, average fuel consumption, remaining fuel metre, immobilizer, options and management for DTC (Ducati Traction Control accessible only with race ECU fitted). DDA system enabled.